Delta models, WNB-3D-400-P, work either with or without a neutral connection, but require a line-to-line voltage connection for operating power. 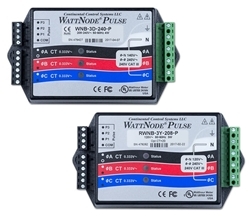 The Advanced Pulse WattNode is a true RMS AC watt-hour transducer with pulse output (solid state relay closure) proportional to kWh consumed. The WattNode provides accurate measurement at low cost to meet your needs for sub-metering, net-metering, energy management, and performance contracting applications. 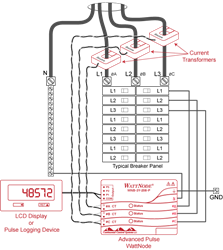 The complete Pulse Output family measures 1, 2, or 3 phases in 2, 3, or 4 wire configurations. 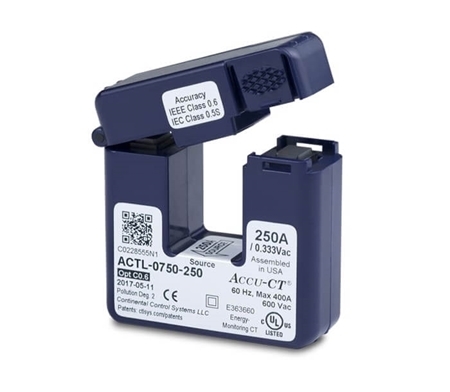 With voltage ratings from 120 to 600 Vac and current transformer (CT) ratings from 5 to 6000 amps, there is a WattNode combination to meet your AC power measurement requirements. Our diagnostic LEDs provide a per-phase indication of power (green flashing) and negative power (red flashing) to help troubleshoot connection problems, like swapped CTs, or excessive line voltage. See the manual for a full description. Standard output provides pulses on one terminal for positive energy and on another terminal for negative energy. This is useful with solar panels, where energy taken from the grid and energy fed to the grid can be metered separately with one meter (net metering). 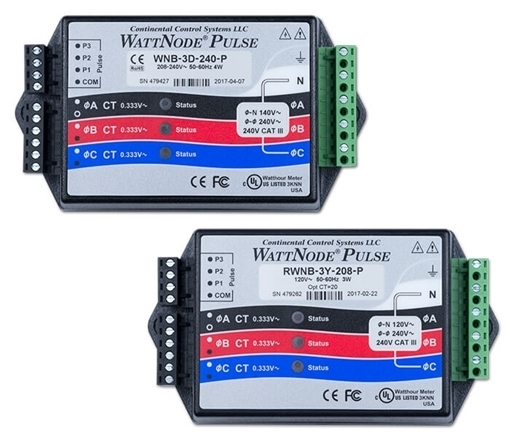 Pulse output—Compatible with energy management systems and data loggers. 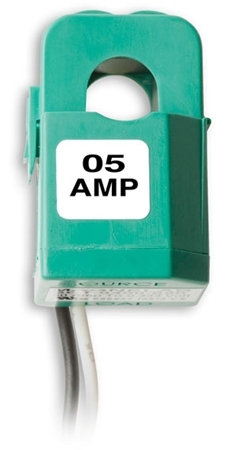 Small size—Can be installed in existing service panels or junction boxes. Bidirectional metering—Net metering for PV (photovoltaic) solar and wind power generation with only one meter. Advanced metering design—Enables metering of inverters and variable frequency drives. Safe CTs—Integral burden resistor limits the output to low voltage. Line powered—No external supply required. Detachable terminal blocks—Easy to install and remove. UL, cUL Listed—Designed and tested for safety and use throughout North America. CE Mark—Can be installed throughout the EU. Warning: Hazardous Voltages - Only qualified personnel or licensed electricians should install the WattNode meter and current transformers. Option Kh combined with Option CT configures the meter for a certain "watt-hours per pulse" value. Optoisolator (phototransistor) output handles up to 60 Vdc at 1µA (microamp) to 5 mA (milliamp).